The annual Distinguished Professor Award and Excellence in Teaching Award continue to be prestigious recognition for superior teaching and research. That’s what the UL Lafayette Foundation intended when it began presenting the Distinguished Professor Award in 1965, according to Julie Bolton Falgout, the Foundation’s executive director. It added the Excellence in Teaching Award in 1992 to recognize commitment to and effectiveness in teaching and instructional innovation. Recipients of the UL Lafayette Foundation’s 2006 Distinguished Professor Award are Dr. Ray Bauer, professor of biology; Dr. Kerry Carson, professor of management; and Dr. Ehab Meselhe, associate professor of civil engineering. Anita Hazelwood, professor of health information management, was presented with the Foundation’s 2006 Excellence in Teaching Award. They were honored by the Foundation at a banquet held at the River Oaks Club this spring. Award winners each receive a stipend and their names are inscribed on plaques on display in Edith Garland Dupré Library. In 1986, Dr. Raymond Bauer left an associate professor post at the University of Puerto Rico to take what promised to be the job of his dreams. A biologist who studies shrimps, he had been hired by UL Lafayette (then known as USL) to establish a Center for Crustacean Research. The university assured him that he would have a teaching position in the Biology Department if plans for the center failed to materialize. A downturn in the state’s economy, and subsequent budget cuts, scuttled the university’s proposed research center. But Bauer remained a member of the biology faculty. “ As events unfolded in the early years after Ray’s arrival here, that fallback plan was ultimately a windfall for both Ray’s career and our department,” recalled Dr. Darryl Felder, head of UL Lafayette’s Biology Department. The UL Lafayette Foundation has presented Bauer with its 2006 Distinguished Professor Award for his accomplishments. Bauer’s designation as a fellow by the American Association for the Advancement of Science is an indication of the respect he has earned in his field. “ To the best of my knowledge, he is one of only two such fellows on the UL Lafayette campus,” Felder said, in a letter recommending Bauer for the Foundation’s award. Bauer grew up in Missouri. “So, I wasn’t all that familiar with the ocean,” he noted. But he was intrigued by television documentaries produced by French oceanographer Jacques Cousteau. He later received a bachelor’s degree in biology from the University of Missouri. He holds a doctorate in marine biology from the Scripps Institution of Oceanography at the University of California, San Diego. Bauer became interested in marine shrimps during graduate school, when he helped one of his professors examine marine life at the tidal level along the California coast. “I thought they were interesting creatures to look at and, in the lab and aquarium, they did all sorts of interesting things,” he said. Thirty years later, he is the professor helping students pursue their interest in marine biology. Dr. Kerry Carson’s natural curiosity and regard for personal growth have taken him on a career path that has had a few twists and turns. His advice to students? “Follow your heart. Do something you really enjoy and realize that your heart will change as you mature.” Carson speaks from experience. A former social worker, he is now a professor of management and recipient of the UL Lafayette Foundation’s 2006 Distinguished Professor Award. Carson earned a master’s of social work degree in 1973 from Indiana University. He began his career in clinical social work, first as a correctional institution counselor for young adult felons, then as a psychiatric social worker who focused on helping children and adolescents. A few years later, Carson joined an executive team for a mental health center, where he directed more than 80 clinical staff members. But in 1987, he went back to school. He became a full-time student on the organizational behavior track of the business administration doctoral program at Louisiana State University in Baton Rouge. He earned a Ph.D. in 1991 and was hired to teach in UL Lafayette’s B.I. Moody III College of Business Administration a year later. In addition to teaching the grad-level practicum, Carson has been instrumental in helping the college attract adjunct faculty, professionals in the community who each teach one or two classes per semester. His efforts to provide students with personal and vicarious “real world” career experience earned praise from the Association to Advance Collegiate Schools of Business, which recently granted the college reaccreditation. “ In the area of research, Dr. Carson is truly one of the stars of the college,” said Dr. Stephen Knouse, head of UL Lafayette’s Department of Management. Carson’s current research areas include health care management, career development, psychological fallout from demotion in the workplace and the history of management. In 2004, Carson attended a Fulbright Seminar in China. He describes it as “one of the most incredible journeys of my life.” Along with a group of professors from other universities, and four colleagues from UL Lafayette, he retraced the path of the ancient Silk Road, trade routes that once connected China with Europe. Since his return, Carson has lectured to two university groups about China’s economy. He has published two articles predicting China’s future economic dominance and what it will mean to business education. Because of his growing interest in international issues, he took the lead in 2005 in the development of two language and culture minors – Francophone and Hispanic – for business students. At this stage in his career, Carson also has become intrigued by another topic: wisdom. “How might students acquire wisdom? How can we integrate it, in a more global sense?” he asks rhetorically. His list of research interests just keeps getting longer. As a civil engineer who studies water systems, Dr. Ehab Meselhe has long been aware of how much damage a major hurricane could cause if it struck Louisiana’s fragile coast. He is a respected expert who, for many years, has been working with other researchers across the state to restore ailing wetlands and barrier islands that once offered a measure of protection from storms. But in August, Hurricane Katrina struck southeastern Louisiana. A month later, Hurricane Rita made landfall in the southwestern portion of the state. Both storms were devastating. “ It’s depressing,” Meselhe said candidly in an interview this spring. There was one bright spot, however. He was presented with the UL Lafayette Foundation’s 2006 Distinguished Professor Award. He had already received the 2006 Louisiana Engineering Foundation Engineering Faculty Professionalism Award. Last year, he was honored by the Coalition to Restore Coastal Louisiana, which gave him its Coastal Stewardship Award. Meselhe was working on two major research projects related to coastal Louisiana before the hurricanes struck. He was developing a comprehensive model for the Chenier Plain, in the southwestern part of the state. It would enable scientists to evaluate existing water management and control structures, as well as assess restoration options. Meselhe was also leading a team of scientists who were developing a large-scale, three dimensional model for the Lower Mississippi River. It will be used to assess existing and proposed projects designed to divert water from the Mississippi River to nutrient-starved wetlands. But the hurricanes, he said, “put everything on hold.” Scientists’ attention, understandably, has been redirected toward protection against the storm surge and flooding that could result from future hurricanes. “ It’s not that protection from storms has been absent from our agenda,” he said. But now it is the highest priority. The dean stressed that although Meselhe’s research is noteworthy, he excels in other areas as well. For instance, he is also a “very student oriented professor” who is popular with undergraduate and graduate students alike. “From my conversations with the civil engineering students, he serves as a great mentor to students at all levels on how engineering can have a very positive impact on society,” Zappi said. Meselhe clearly enjoys teaching. “There is nothing more rewarding than seeing your own students succeed,” he said. Meselhe serves as a mentor to several young faculty members, offering advice about obtaining grants and implementing projects. “His guidance has been instrumental in making the Civil Engineering Department the most R&D (research and development) productive department within the college over the past few years,” Zappi said. When Anita Hazelwood and her sisters were growing up, they would transform their bedrooms into classrooms every day during the summer so they could play “school.” These performances, complete with make-believe students as her audience, began Hazelwood’s journey into teaching. “ From day one, all I’ve ever wanted to do was teach,” said Hazelwood, a professor of health information management. Her years of “playing school” with her sisters, and her years of studying, have paid off. Hazelwood is a respected expert in the medical coding field and has co-authored five coding textbooks used in classrooms and physician’s offices nationwide. She received the 2006 Excellence in Teaching Award presented by the UL Lafayette Foundation. Hazelwood began her career at the University of Louisiana at Lafayette as a laboratory assistant and worked her way up to instructor, assistant professor, associate professor and professor. 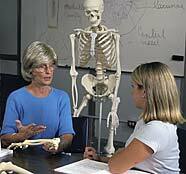 She has taught classes at all levels and coordinates two clinical courses in the HIM curriculum. Hazelwood is known for using innovative teaching methods. “ She has the ability to take an ordinary course filled with difficult material and actually make it fun. She has designed a couple of games (fashioned after the television program “Who Wants to Be a Millionaire”) that enhance students’ coding knowledge and make learning new material a lot less difficult,” said Carol Venable, HIM Department head. “ Another example of Anita’s teaching excellence is the fact that she was one of two faculty members asked to teach workshops nationally that helped to prepare graduates to successfully pass the national certification exam that is taken following graduation,” Venable continued. This type of work gets Hazelwood well-deserved recognition among peers across the country. In 2003, she was presented with a Legacy Award from the American Health Information Management Association, the premier association for HIM leaders, for her extensive work in the HIM profession. Hazelwood has earned fellowship status with the AHIMA. She is one of only 31 fellows designated by the association. Most recently, she finished writing chapters for three textbooks, which took more than a year because of her busy schedule.